In a small saucepan, bring maple syrup and pecans to a boil and stir in juice. Remove syrup from heat and keep warm, covered. In a bowl, whisk together flour, cornmeal, sugar, baking powder and salt. Quarter banana and in a blender puree with water. Transfer puree to another bowl and whisk in eggs and melted butter. Add flour mixture and stir until combined well. 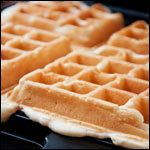 Heat a well-seasoned or non-stick waffle iron until hot and brush lightly with oil. Pour half of batter into iron and cook waffle according to manufacturer's instructions. 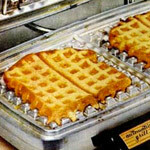 Transfer waffle to a baking sheet and keep warm, uncovered, in oven. 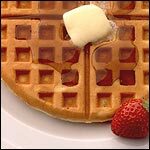 Make another waffle with remaining batter in same manner. 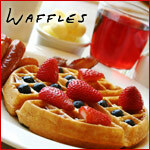 Serve waffles with syrup. The syrup in this recipe could go with any waffle, pancake or French toast, but it goes particularly well with the banana flavor in these waffles. 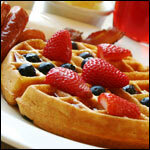 What do you think of Banana Waffles With Pecan Maple Syrup? 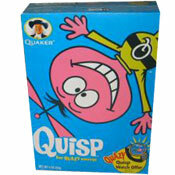 These are the best. I did add 1/4 more milk. Really good. Thick pancakes... I would recommend adding 1/2 cup milk or decreasing the flour for lighter fare. Good taste though!